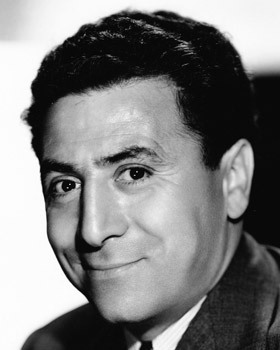 Born Jacob Perlman this day in 1895, Jack Pearl is best known for the national catchphrase “Vas You Dere, Charlie?”, which he uttered as the “Dutch” (German) character Baron Munchausen on radio and in films throughout the 1930s. (This way to an audio clip) . Apart from the name, Pearl’s Munchausen character had nothing in common with the famous novel (later made into a movie by Terry Gilliam). A Lower East Side native, he’d gotten his start in one of Gus Edwards kiddie acts, before working with a succession of partners and working his way up to his own vaudeville act and Broadway revues. Once his radio show was canceled, he found he was too closely identified with a fad that had passed and he found it hard to get work. There were a handful of later stage, film and TV roles, but they were few and far between. He passed away in 1982. Here is a clip from his starring film Meet the Baron, released at the height of his fame in 1934. This crazy comedy (fully in tune with the madcap tastse of the era) also features Jimmy Durante, Zasu Pitts, Ted Healy and the Three Stooges, the Boswell Sisters, Lyda Roberti et al. To learn out more about vaudeville, including stars like Jack Pearl consult No Applause, Just Throw Money: The Book That Made Vaudeville Famous, available at Amazon, Barnes and Noble, and wherever nutty books are sold.